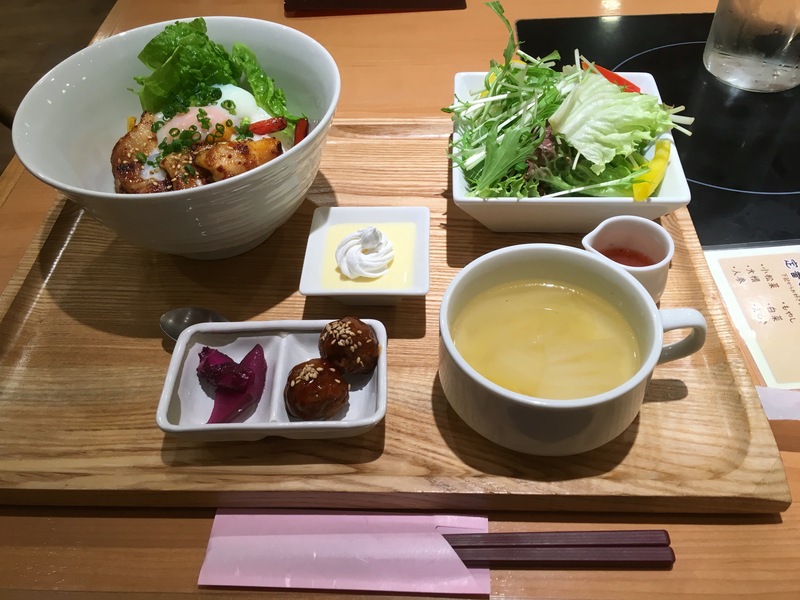 Miso chicken sukiyaki don, salad, soup, tsukune and pickles, and a vanilla pudding in the center. TONVEGE is actually a shabu shabu restaurant, but it offers these lunch sets as well and this one was seriously good. The restaurant is in Lumine EST, somewhere in the vicinity of Shinjuku station’s east exit. I think so, anyway – I’ve been to that train station so many times now over the years and I’m armed with Google maps these days, and I still manage to come off second best navigation-wise. Yesterday, we did okuizome, a “first meal” ceremony held for Japanese babies when they reach either 100 or 120 days old (depending on the region). My mother-in-law brought over the elaborate food shown above and laid it out on the special dishes above. The dishes have been in the family for 40 years, so I guess that was kind of neat. Mr. K didn’t actually eat of the food; even if babies were encouraged to be weaned that young, the food would have been far too rich for him.From what I can gather, it’s meant to be a time for families to gather and most families pretend to feed the baby and then carry on feasting. Link link here! My mother-in-law basically orchestrated the whole thing without consulting or inviting anyone else, and R pretended to share some of his lunch with Mr. K, a takeout bento that is definitely not pictured above. After setting out all the dishes, my mother-in-law took some photos of the food (I’m not 100% sure she included Mr. K in the photos at all; I was holding him and there was certainly no attempt to make us pose?) and packed everything away again.I spent most of my time trying to keep an increasingly grumpy baby in check and waiting for instructions that never came. Why yes, my relationship with my mother-in-law is a difficult one! Anyway, I don’t want to detract from what could be a nice ceremony with my husband’s family’s bizarre behaviour. I think, in different circumstances, it’s quite a cute thing to do, it’s certainly very pretty looking and given I identify as agnostic these days, I think it could be a good alternative to a Christening. Since Mr K was born, I’ve had the pleasant experience of people falling over themselves to help me when I go out in public with him. They hold doors open for us, clear paths for us, and spring up from their seats to offer them to me. I even had an elderly lady help me haul the pram (and the grumpy baby therein) onto the bus today. It’s great! I can’t help but feel a little frustrated on behalf of my former self, though. When I was pregnant, it was a different story completely. I had a grand total of two people offer me seats during the whole forty weeks (and two days), and both of them (a mother with a baby and a very old lady) were in need of seats themselves. There’s nothing like catching the bus on what is supposed to be your due date and STILL not being able to get a seat. While the pram can be a bit of a pain to lug around, doors present a strange new challenge and I feel even more anxious about taking up too much space in petite Japan than I usually do, I am physically fine. Yes, I’m tired – sometimes very tired – but I otherwise feel pretty much like myself. I wouldn’t say managing Mr. K in public is necessarily easy, but it’s something I feel capable of doing. When I was pregnant, though? I felt crap almost from the outset. It was nine months of extreme fatigue, physically and mentally, not to mention the morning sickness and aching body. I might not have felt utterly incapable of getting myself around, but it frequently meant summoning reserves of energy and exerting extra effort. I know it can be hard to tell if someone’s pregnant or not sometimes and there’s a risk of awkwardness (Japan doesn’t have that excuse, by the way – pregnant women have been getting the above-pictured tags issued by their cities for their bags, which clearly state the woman is pregnant, since 2007). While I’m not ungrateful and I don’t wish to sound it, if I could choose between getting those little acts of kindness right now and back then, I would be choosing pregnancy. The 24 divisions are each split again into three for a total of 72 kō that last around five days each. The names were also originally taken from China, but they did not always match up well with the local climate. In Japan, they were eventually rewritten in 1685 by the court astronomer Shibukawa Shunkai. In their present form, they offer a poetic journey through the Japanese year in which the land awakens and blooms with life and activity before returning to slumber. If you follow the link here, you can read the full list of microseasons, which have lovely names like “Mist starts to linger” (February 24 – 28), “Warm winds blow” (July 7-11) and “Chrysanthemums bloom” (October 13-17). What about where you live? Are there some “microseasons” that vary enough within the regular four seasons that they deserve some special recognition and/or a beautiful name? Valentine’s Day in Japan is… well, a bit different. Here, women are expected to give the men in their lives chocolates. For the men we’re not especially close to – coworkers, friends, classmates – there is cheaper giri-choco, known as obligation chocolate. For those we’re especially close to – romantic partners, brothers, fathers, close friends – more elaborate preparations are needed, for these chocolates should be expensive, homemade, or both. Recently, in a nice twist, girls and women have been giving their female friends chocolates as well. Men aren’t required to reciprocate on Valentine’s Day. Instead, there is another event in one month, on March 14th, called White Day. That is when men are supposed to return a gift worth three times the value of whatever the woman gave him. Since White Day doesn’t exactly receive the same level of marketing, this is one of those things that sounds very nice in theory. Being still sort of on maternity leave, I got to forego the giri-choco altogether this year, though I will give some chocolates to the sole student who has resumed English lessons so far (more will in March). That left R. He tends to pick and choose if he’s going to celebrate Valentine’s Day the “foreign” way (i.e. the way in which most people reading this are familiar) or the Japanese way. I don’t need to be a mindreader or even particularly cynical to know that his decision is based on 1) whether he remembers the day and 2) whether or not he can be bothered shopping in February. I usually only find out on the day… aaaaaaaaaaaand it seems we’re doing things the Japanese way this year. Yay? Anyhow, I still made him the above-pictured chocolates and, this year, I managed to pull off the winning combination of them being easy to make, delicious and fairly well-presented. As a reminder to myself next year as well as a note to anyone else who is vaguely interested, this is how I did it. * The latter two are readily and cheaply available here at this time of year. Break up all the chocolate bars into pieces and put them into the smaller bowl. Put smaller bowl into larger bowl and pour boiling water into the larger bowl, around the smaller bowl. This is to melt the chocolate. Wait. Feed the angry baby. Feed the angry cat. About 15 minutes? If the chocolate still hasn’t melted, replace the water with more boiling water. Mix the melted chocolate and add in the cream. When the chocolate has just started to set, press one of the mixed nuts into the top of each. You want the chocolate to still be malleable enough that the nut sets in, but not so fluid that the nut sinks into chocolatey oblivion. Extract from fridge shortly before gifting and arrange in box! After a week of strong winds, we’re experiencing some unseasonably warm weather just now. This happens nearly every February; the weather will get nice enough for a day or two that you can temporarily forget how cold it usually is and get excited about spring. Then the temperatures plummet and anther six weeks of cold weather ensue. Thus, you enjoy this pretense at mid-April while it lasts. I took Mr. K for a walk, as I do most days, and meandered over to the big local park where we discovered that even some of the trees had come to the pretend-spring party and blossomed. In keeping with the theme of things, sedate blossom viewing was ensuing. And into this scene of tranquility (inadvertently) crashed me and my angry son. He seems to be going through a growth spurt right now and his sleeping patterns are all over the place. He is also particularly clingy and he had lost his dummy (pacifier) en route. He was in a rage. To top things off, I was armed with a much-needed coffee and a donut from the 7-11. Sitting on a park bench and sipping coffee, even with a crying baby attached, might be perfectly normal in my home country and yours, but not so much over here and especially not when there’s an unspoken expectation to maintain the atmosphere. A foreign woman, eating outside, with a crying baby in a pram? Forget channeling the spirit of old day Japan. We got an unusually high number of glares from elderly wanderers and amateur photographers. Mr. K did eventually chill and fall asleep… right before we met a pair of women who also had babies and wanted theirs to meet mine. Sigh. Still, it was a nice – if unintended – outing. Image from Clark University’s Ethiopia blog. Do have a look at the linked article. I really love shopping at H & M, and I feel like I probably shouldn’t. It all started in late 2013. I know I’d heard of H & M prior to 2013. I’d possibly even visited their stores. It didn’t really leap to my attention, though, until I was in Kuala Lumpur and looking to go on a shopping spree. There was a particularly prominent store in Bukit Bintang, where I was staying, and inside it were three floors of affordable, fashionable clothing. Much of it was even in my size, a refreshing change after Japan, and H & M are Scandinavian and that somehow makes them all the cooler (look at that pun there!). Fast forward to the present and I find myself shopping at H & M, if not often, then at least regularly, particularly over the last year or so. There are women’s clothes that I like and fit me well, and men’s clothes for R. They sell maternity clothes, a huge bonus when Japanese maternity lines are definitely not designed for my tall, largish build, are very conservative, and often very heavy even during the hellishly humid summer, and they sell baby clothes, including packs of adorable onesies made from organic cotton. There’s now a branch near-ish to where I live and that just makes the whole thing even easier. They’re cheap, and they even have a nifty clothes recycling program, where they will recycle your old clothes, whatever their condition, and you walk away with a discount voucher. It’s great! As noted in the video, the idea that the production system of a global textiles giant is possibly bad for both the workers and the environment probably isn’t news to anyone. It certainly wasn’t to me. And yet, I keep shopping there. I want to be the sort of person that buys clothes from People Tree and Bamboo Village, but I’m not managing it yet, not least because of the cost involved. Shopping at H & M is on a long list of consumption choices where it feels like I might be a better person if I chose differently and while I do want to make those choices, they’re difficult, especially over here, and to me, expensive. In the meantime, H & M is cheap. It’s easy. The clothes fit. Even the mall where the shop I visit is located makes for a fun trip out. In short, I like them. It’s just it’s kind of in spite of knowing better.